When Rotorua's, Waiariki Institute of Technology launched their current indigenous art conference, few could have guessed that some of the colour and creativity on show would feature two of DC's biggest icon's. 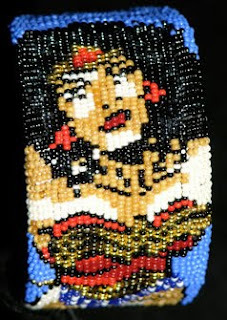 Both the emerald glow of Green Lantern Hal Jordan, and the solid gold bustier of Wonder Woman make the display, rendered as part of the bead work of Native American artist, Marcus Amerman. Measuring only 6cm across and 12cm round, the DC icon cuffs are done directly onto leather, with amazing detail. 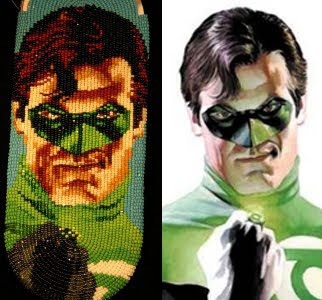 Just look above at comparison between Marcus's version - done in hundreds of tiny wee beads - and the original Alex Ross Green Lantern painting, for an example of the skill involved. Thanks to IADW visitor Jonathon Hagger for the heads up on this story. For more information on the art of Marcus Amerman visit his website.